Don’t try and swipe copper cable from construction site, it is a dangerous game, as this bloke found out. A man suffered massive electrical burns as he tried to steal copper wire from a vacant Brampton factory transformer, Peel police say. 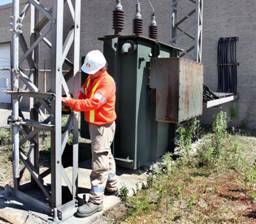 The 49-year-old man suffered life-threatening burns to 90 per cent of his body late Thursday when he was zapped by 44,000 volts on the transformer wall. He is clinging to life at a Toronto hospital. The man had been cutting heavy copper wire from a tower beside the transformer and stuffing it in a backpack when he apparently fell against the side of the high-voltage box behind a Glidden Rd. factory, near Steeles Ave. E. and Hwy. 410. He had cut a hole in a high chain-link fence to access the transformer at about 11:30 p.m. Despite his injuries, the man climbed back through the fence hole, jumped on his bicycle and pedalled to the street, where he hailed a passing bus. The driver called 911 after seeing the man’s burns. An officer said the thief is well known to police. He said the man suffered severe facial injuries last year when a propane tank, from which he was trying to steal a copper valve, exploded in his face. Copper wire and other items made from the metal have been targeted by thieves across Ontario in the past year as the price of precious metals has climbed on scrap markets. Last month, Halton police said a large copper statue was stolen from an Oakville cemetery, where it had guarded a family plot for a decade. The $10,000 statue, crafted in China, still hasn’t been recovered.